This time, however, we learn how Sully and Nathan Drake first met. We also learn more about the ring that Nate has worn around his neck throughout the series. The big baddie this time around is a woman who is the head of some massive, clandestine organization with large, hidden lairs underground. And lots and lots of zealous peons who would like nothing better than to shoot at you from behind cover. …or from a burning building. …or from a sinking ship. These gunmen are a bit overachieving. The game also includes a new, improved melee combat system. 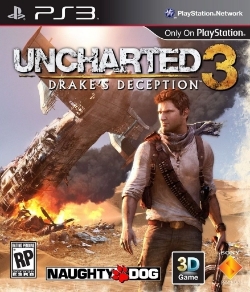 Naughty Dog must be very proud of it, because they force you to use it at semi-regular intervals. In the beginning, you will be amazed at how fluid and natural combat looks. Halfway through the game, you will get quite bored of watching Nate stomp on another cronies’ feet and double uppercut them to the chin. The main problem is that this game feels a lot like the second one in the series. Perhaps Sony forced development in two years rather than three, and that hurt the game. There are only a few scenes in the game that feel fresh, but they are spectacular. One scene in particular, which takes place on a sinking ship, is truly original. And the sand that shows up at the end of the game is truly a sight to behold. And behold it you will — because control of Nate will be constantly yanked from your controller so that “they” can show you some movie-like scenes. This is likely the biggest problem with the game. The second game felt like a game produced by the movie industry. The third game plays like a movie with some interactive shooting and puzzles. All of the exposition takes place in cut scenes, and there is A LOT of exposition and character development. This would be fine, if you were not constantly feeling like an outsider watching in. All this would be fine if there it were more like a movie. Perhaps this was done to pad the game, since it is not that long. With all the cut scenes, the game can be finished in well under 10 hours. I would rather play a shorter game with fewer cut scenes that be forced out as a participant for the added time. While the game is not ‘bad,’ and is in fact good, it is just a disappointment after the amazing leap forward in gaming that uncharted 2 felt like. This feels more like uncharted 2.5.